MILLVILLE – Nobody told the Hurricane Tigers they were supposed to get blown out by No. 1-seeded Ridgeline. In fact, Hurricane looked like the more complete team for more than three quarters of the first-round playoff contest at RiverHawk gymnasium. But the fourth quarter was a killer for the Tigers, who were outscored 20-8 in the final stanza and fell 72-59 to Ridgeline Friday night. Ridgeline also turned to its star, Jaxon Brenchley, who pretty much carried his team to the win. Hurricane was stunning the capacity crowd at RHS until late in the third quarter. With 2:33 to go in the third, the Tigers led 48-40 after back-to-back treys by Josh Parker and Jackson Last. Then Brenchley found his groove. The senior scored in the lane for a three-point play, then got a steal and layup to make it 48-45. Parker and Nate Ben combined for three free throws to push the lead back to six at 51-45. But Brenchley assisted on consecutive plays to Landon Jenson, one off of a Brenchley steal, to make it 51-49. Then Brenchley buried a 3-pointer just before the buzzer to end the third and just like that, the Tiger lead was gone. Starting the fourth, the trend continued. Brenchley rebounded a Last jumper and led the break, assisting on a layup by Dallan Larsen to make it 54-51. After a Hurricane turnover, Brenchley hit a pull-up jumper to make it 56-51, the Ridgeline scoring streak reaching 11 unanswered points. Theron Wallentine scored on a three-point play a moment later (off a Brenchley assist) to cap what ended up being a 14-0 run that changed a 51-45 Hurricane lead into a 59-51 RiverHawk advantage. Brenchley scored or assisted on all 14 points. Hurricane would never challenge after that and when Brenchley checked out of the game in the last minute of play, his line read: 30 points, eight rebounds, six assists, two steals and a block – with just one personal foul and three turnovers. 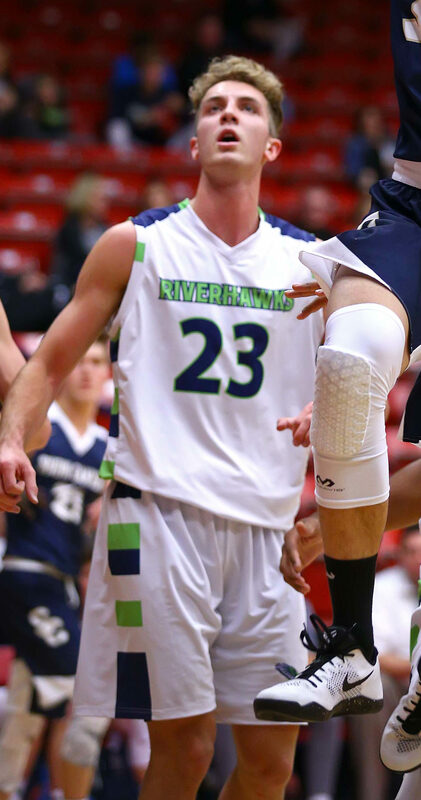 Larsen chipped in 14 points and Wallentine had 11 for Ridgeline (18-4), which advances to the state 3A quarterfinals and will play Carbon at 11:10 a..m. Thursday at Utah State’s Spectrum Arena. Parker led the Tigers with 23 points in the senior’s final game at Hurricane, including three 3-pointers. Last had 10 points, six rebounds and five assists for the Tigers, who finish the year 13-12 overall.